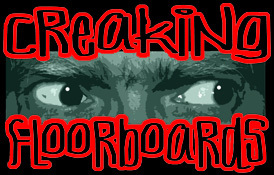 If you have any Mississippi ghost stories you'd like to share with us, please click here. This ghost story dates from the Civil War and comes to us from a time when the people were dealing with death on a daily basis — during the Siege of Vicksburg. Here is the story of Digger. His real name was Tom Mallory, an Irish miner caught in Vicksburg by the advancing Union troops during the Civil War. Digger took advantage of Vicksburg's misfortune and started excavating caves. A captain in the Louisiana militia employed Digger to construct a cave to shelter his wife and children. Digger, who hurried the job, picked an unsuitable site for the cave. Not long after, a mortar shell exploded over the cave, causing it to collapse in the children's chamber. He and others tried to dig the children out, but the cave kept collapsing. Finally, everyone knew it was too late. The children were never found. That was the last day Tom Mallory would rest for his life — and beyond. The Confederates later hired Digger to design and supervise a countermine to intersect the tunnel being built by Union soldiers. Digger, alone in the countermine one day, extinguished his lamp since he felt his shovel punch through into the Union tunnel. Looking closer at the opening, he saw a light shining. Digger was frozen in horror as he watched the dirty, decomposed body of a child crawl toward him. A second, smaller figure pushed through the opening and then stood grim, with eyes protruding from its sockets and white bones exposed from hands and arms. The crew found Digger in the dark whimpering, mumbling, "The children, the children." The Confederate crew looked through the opening Digger had made just in time to see the lit fuse racing toward a stack of powder. They tried to get Digger out, but hugging his shovel, he was paralyzed. His shaky voice repeated, "No, no, the children." The powder gallery exploded. Digger was never found. Sometimes his old miner’s lamp flickers in one of the hollows. Evidence of freshly dug holes proves his soul still wanders the park. He will never rest until he finds the children. From the National Park Service's pamphlet "Park Myths." Image of the Shirley House from the J. Mack Moore Collection, courtesy of the Old Courthouse Museum in Vicksburg. 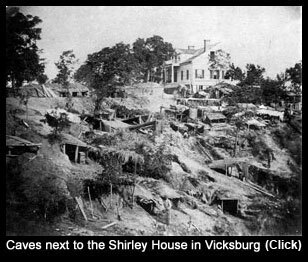 Click HERE for more information about tunnels and explosive mines used during the Siege of Vicksburg. Click HERE to visit the Old Courthouse Museum's photo tour page of Vicksburg during the Siege. These two links will open up new windows.